The Metaphysical Poets provides an introduction to the work of six strikingly various and original poets- Donne, Herbert, Crashaw, Vaughan, Marvell and Traherne. By closely examining how the poems work, the book aims to help readers at all stages of proficiency and knowledge to enjoy and critically appreciate the ways in which fantastic and elaborate styles may express private intensities. The emphasis is on the differences covered by the term 'Metaphysical' and on the rich and strange diversity of the poets' inner lives. 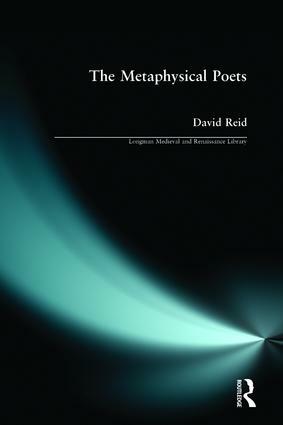 The book examines the expressive forms of interiority, the characteristic inward turn of Metaphysical wit, and compares the wit of its six poets with the non-introspective wit of poets such as Cowley, the Cavaliers and the Augustans. The discussion of each poet is preceded by a 'Life' in which the biographical facts, personal, cultural and political, are treated with a view to illuminating the concerns of the poems. David Reid is a Lecturer in the Department of English Studies at the University of Stirling, UK.